At Hilltop Structures, we have recently increased our different styles to offer six unique sheds. The Jefferson “or Barn style” is a very practical structure due to its versatility and headroom / loft space. Need a small shed to store garden tools? Go for the 10’x10’ model. Need a huge shed that functions as both a storage unit and a workshop? Get yours built all the way up to 16’x46’ and anywhere in between! 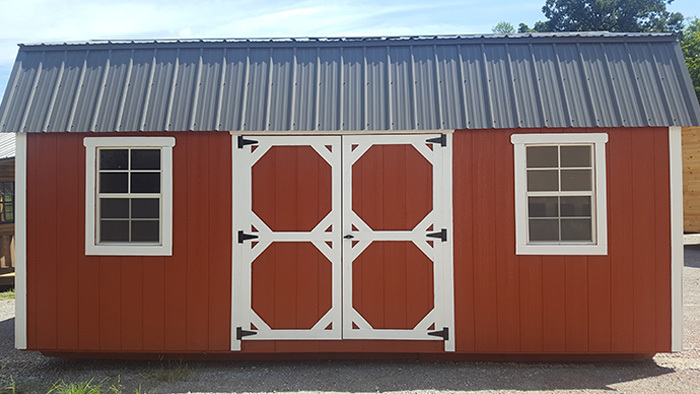 All Jefferson Utility Sheds come with a 12-monthy warranty, (and a siding Manufacturer’s warranty of 5/50 yrs) and they’re built to last for many years due to the fine craftsmanship and top-notch materials used in our workshop . Spruce up your shed with a flower box. This small touch makes a world of difference in the appearance of your shed and adds a “homey” feel regardless of where it sits on your property. Shutters are another essential option for transforming a structure into a cohesive part of your home and property. A ramp makes it easy to store lawnmowers, tractors, ATVs, dirt bikes, and other heavy machinery and recreational vehicles. Choose from a 24x27 up to a 30x36 window. Bringing natural light into your shed is essential for making it a cozy and comfortable place to work. Transom windows are another option that are very popular. Set your shed apart from all the others with a 20” cupola topped off with a beautiful shiny copper colored roof. You may choose between a Fiberglass door, a standard set of double doors which gives you a 72” wide opening or an even wider roll up door (we have 6’,8’ or 9’ available) Fiberglass is both lightweight and extremely durable. That means your shed will be easy to open during any weather and capable of withstanding the hardest rains and winds. Or you can choose a 36” fiberglass walk in door along with an optional roll up door on the gable end. Need extra storage in your shed? No problem! All sheds built 12’x16’ or larger come with a free 8’ storage loft. 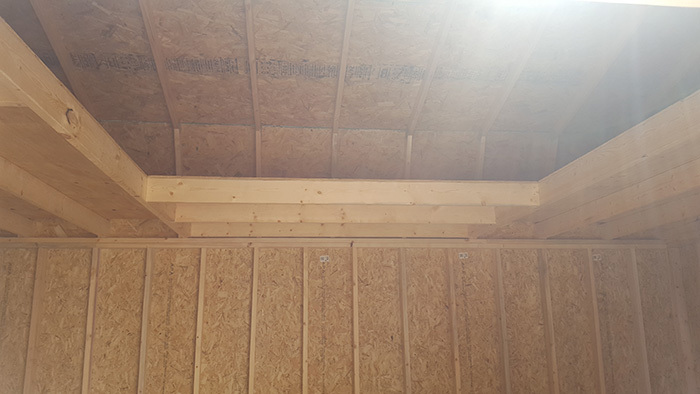 We even offer the option to build a special U-shaped loft, this loft is a big hit primarily on the sheds with the doors in the middle of the long wall. — be sure to ask about it when you place your order. Smooth textured T&G shed floor, Techshield on the roof (radiant barrier sheeting), 2 transom windows, and upgraded hardware are all part of the Grand package. 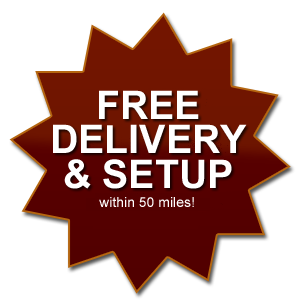 In addition, you also get free delivery and setup if you live within 50 miles of our workshop in Dickson County, Tennessee, 37051. 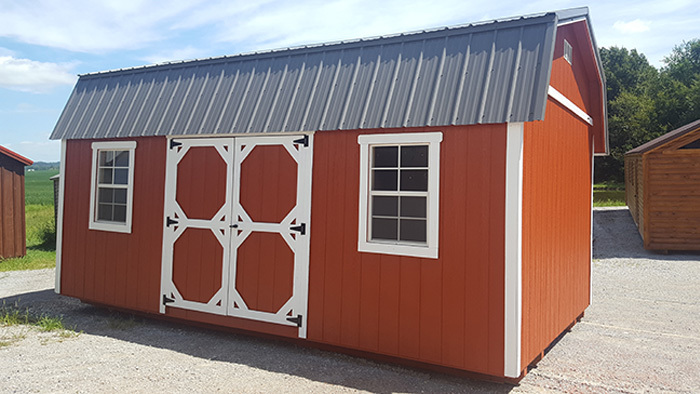 If you’re looking for a versatile, attractive, and durable shed for your property, home, or business, look no further than the Jefferson Utility Shed. Our sales team is waiting for your call, and we’re also available to assist you in person if you want to check out the shed at our workshop. Contact us to order a shed, set up financing, or schedule an in-person viewing.